At the conclusion of the Spider-Man: Hobgoblin Lives mini-series, Roderick Kingsley is placed in jail for his crimes as the Hobgoblin. Kingsley, aware of Osborn's dual identity as the Green Goblin, is sickened by Norman's new squeaky clean façade. Roderick scoffs at the supposed philanthropist's claims that he never was the Goblin, rather the victim. Meanwhile, Norman is currently on a publicity tour advertising his new autobiographical book, Survivor of the Big Lie, which details his "account" of the events that led to his exile to and subsequent return from Europe. Roderick becomes fed up with the "good guy" Osborn and decides to make his knowledge of the Green Goblin's true identity public. This marks the first direct conflict between Norman Osborn and Roderick Kingsley, and it is featured in Spectacular Spider-Man #259-261 as a three part story arc entitled Goblins at the Gate. 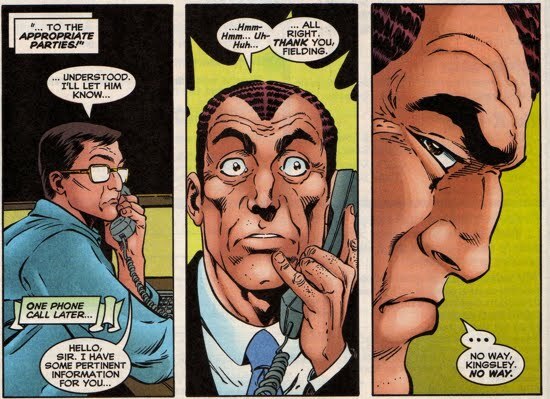 Part one of the story arc, in Spectacular Spider-Man #259, begins with Norman Osborn making a television appearance on the "Reggie and Katie Mae Show" to discuss his new book Survivor of the Big Lie. Kingsley observes the interview from his jail cell and decides that this farce must come to an end. Enraged by fact the he is rotting in jail while Norman is a free man, Kingsley decides to contact his lawyer to discuss a deal with the District Attorney. Later, Norman continues his "good guy" persona with the staff of the Daily Bugle, offering pay raises across the board due to the financial success of his autobiography. His blatant deceit causes both J. Jonah Jameson and Peter Parker significant inner turmoil. After Kingsley's discussion with his lawyer, Norman eventually gets tipped off to the prisoner's plan via his "eyes and ears" and decides to thwart Kingsley's effort immediately. When Roderick Kingsley is secretly transferred from his prison cell to meet with the D. A. regarding his testimony, the Green Goblin V arrives to abduct him. Spider-Man intervenes, but Kingsley refuses Spidey's aid, kicking the wall crawler off of the Goblin Glider. He tells Spidey that his help is "quite unnecessary." 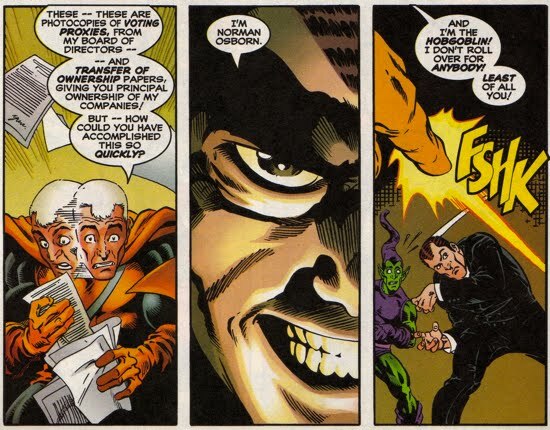 The Goblin decoy then brings Roderick face to face with the man he has stolen so much from, Norman Osborn. The story continues in Spectacular Spider-Man #260, where Roderick tries to convince Norman that there is one remaining journal that was not destroyed back in Amazing Spider-Man #250. Norman is not convinced that Roderick is telling the truth, claiming that his "intelligence operatives" confirmed that all Osborn's journals were destroyed earlier. Roderick than entices Osborn with the offer of "pooling their resources" and basically teaming up as allies. 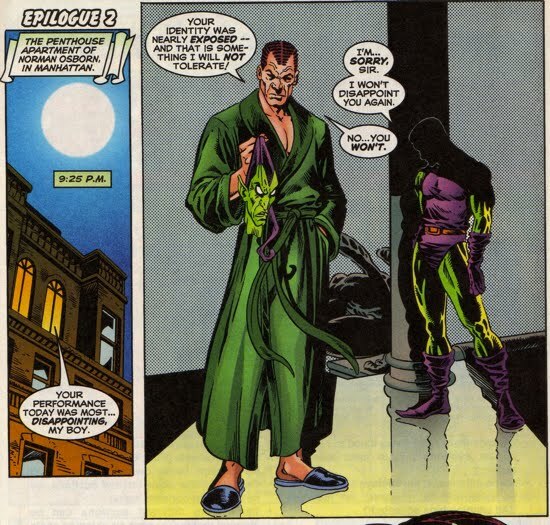 Norman doesn't accept, but allows Kingsley some time to "convince him [Osborn]". 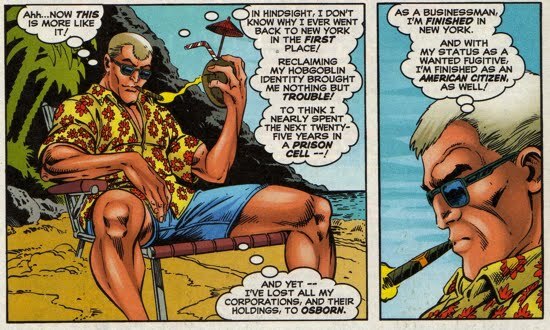 After some mutual praise, Kingsley and Osborn formulate a plan to benefit both of their interests. Kingsley informs Norman that his brother twin brother Daniel knows the location of this "missing" journal, but that he does not know where he's located in since he was placed into protective custody. In exchange for revenge upon his twin brother and safe passage from the country, Kingsley offers Osborn the journal and the keys to his company Kingsley Ltd. Norman accepts and provides Kingsley with his Hobgoblin attire to perform the abduction of his twin, but that's not all Norman does. He double-crosses Kingsley and tells his Goblin decoy to trail the Hobgoblin and to kill him, and his brother Daniel, once he's recovered the journal. Through Norman's informants in the D.A. 's office, Kingsley is able to track down his brother, but Spider-Man is there to stop him. Spider-Man and the Hobgoblin trade blows and after a pumpkin bomb nearly kills both of them, the Green Goblin V arrives and sedates Spider-Man with a tranquilizer. The Goblin informs Kingsley that he was there as "back-up". The story ends with a cliffhanger as the Hobgoblin reaches to unmask the unconscious Spider-Man. The third and final chapter of the Goblins at the Gate arc is featured in Spectacular Spider-Man #261. 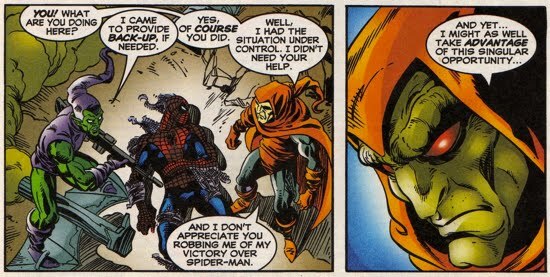 The Hobgoblin's attempt to unmask Spidey is immediately hampered by a laser blast from Green Goblin. 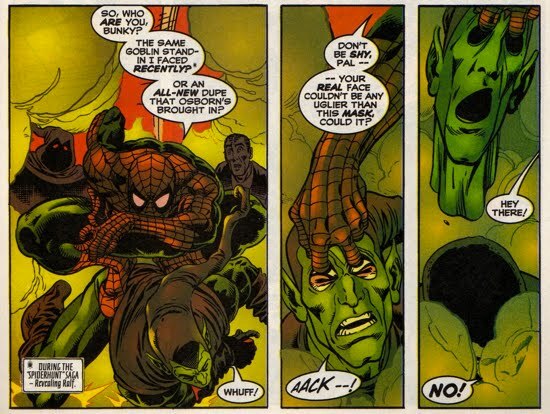 The Green Goblin tells Kingsley that he is not to unmask Spider-Man because "that's not what [they] are here for." The Goblins then take both Daniel Kingsley and Spider-Man, who is wrapped up in his own webbing, prisoner as they continue their search for the remaining journal. Unfortunately for the Goblin duo, Daniel passes out from his fear of heights, so they return with their two abductees to Norman's hideouts. 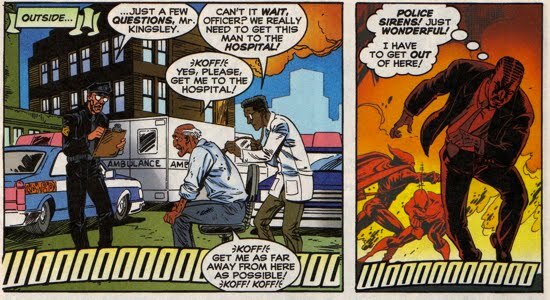 Kingsley offers Spider-Man's identity (unmasking) to Norman as a consolation for not finding the journal, but Norman's disinterest in the offer convinces Roderick that Norman already knows Spidey's identity. Osborn eventually grows tired of Kingsley's delays and decides to call his bluff, claiming that he will administer a drug to Daniel to awaken him. Roderick panics and Norman reads him perfectly as he realizes that there never was a "missing" journal revealing Norman's history as the Goblin. With his suspicions confirmed, Norman tells Roderick that there is no reason to keep him or his brother alive, but Roderick objects. 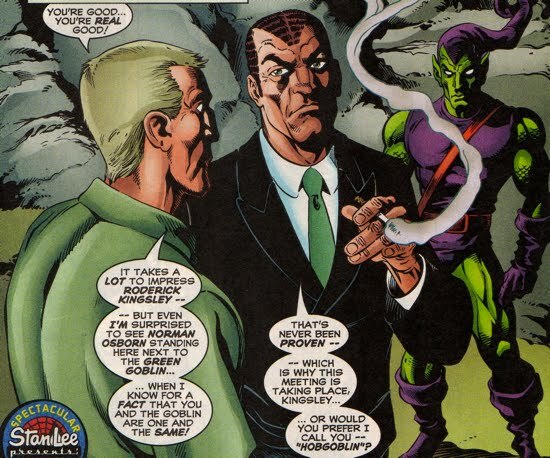 Kingsley claims that Norman still needs him to help in handing over all Kingsley Ltd. holdings, but Osborn touts that is "too late" because he has already taken over Roderick's business interests. Kingsley now has lost all of his bargaining chips and decides that he is not going out without a fight, the infuriated Kingsley attacks Norman. But Osborn does not back down and as the two spar, Norman realizes that Kingsley, strength-wise, is a pretty even match. Spider-Man eventually wakes from his sedation and frees himself from his webbing. Explosions from various pumpkin bombs cause the hideout to go up in flames and in the melee Spider-Man unmasks the Goblin decoy but is unable to discern his face through the smoke. 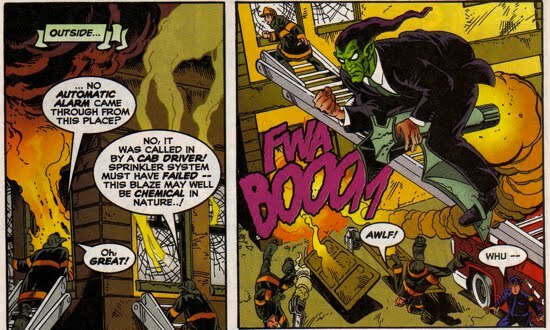 Kingsley and Osborn continue to go at it, but as the authorities arrive, Osborn flees using the Goblin decoy's mask and glider. There was a brief moment where Spidey thought twice about letting the two of them kill each other, but he had a change of heart and decided to separate Norman and Roderick. Norman once again avoids being exposed as the Green Goblin. The Hobgoblin is able to escape as well while Spider-Man is distracted saving the firemen who are helping to put out the burning building. At the conclusion of this story arc, Norman has absorbed all of Kingsley's holdings into his company while Kingsley himself is a wanted fugitive. Kingsley is last seen on the Caribbean Island of Isla Suerte as he contemplates whether or not he will ever wear the guise of the Hobgoblin again.